Founded in 1962, the American Symphony Orchestra ranks as one of the most important contributors to the classical music scene in New York. Under the leadership of Leon Botstein, the ASO offers thematic series of concerts that highlight the connections between music and literature and their cultural, political, and historical influences. Fortunately for audiences eager to hear unusual repertoire, this innovative programming initiative often turns up long-forgotten titles that, despite their obscurity, retain rich musical value. Such was unquestionably the case when they offered the first of Franz Schmidt's two operas, Notre Dame, in Isaac Stern Auditorium at Carnegie Hall in March 2012. Schmidt was born in 1874, in the city of Pozsony, Hungary (now, Bratislava – the capital city of the Slovak Republic). Hungarian and German by heritage, he received his musical training in Vienna, where he continued to live for most of his professional life. In addition to his excellence as a composer, Schmidt was widely praised for his skill as an instrumentalist. He was an accomplished pianist, and gained prominence as a cellist while playing in the Vienna Philharmonic Orchestra for many years. The orchestra's chief conductor – none other than Gustav Mahler - apparently insisted on having Schmidt for his cello soloist whenever possible. He was also a virtuoso organist; the evidence of his love for the instrument can be heard in his orchestral compositions, including Notre Dame. Finally, Schmidt also passed on his knowledge as a highly revered teacher and mentor, eventually assuming the top position at the Vienna Conservatory, where his pupils included a long list of distinguished musicians. Given the intricacy and exotic beauty of his compositions, it is tempting to seek out an explanation for why Schmidt's reputation has largely faded from public view. While there are a number of potential points for discussion – not the least of which is Schmidt's eventual acquiescence with the rise of Nazism in his homeland – the true reason is probably quite banal: his highly romantic musical aesthetic was already 'old-fashioned' by the time he was able to get Notre Dame produced on stage in 1914. His lush tonalities and sweeping orchestral effects were at odds with the new Viennese compositional school as championed by the likes of Schönberg, Berg, and Webern. Perhaps even more of an obstacle to a lasting legacy, Schmidt's creative years overlapped with an impressive array of brilliant composers including Bruckner and Brahms early on, and then later, Mahler, Reger, Pfitzner, Schreker, Zemlinsky, Strauss, and many others. With such stiff competition from the nationalist and modernist musical movements, it seems inevitable that – some eighty years later - Schmidt's works are seldom encountered in the concert hall and on stage. His grand choral opus The Book with Seven Seals has received rightful attention, but the remainder of his catalog remains elusive. His second opera, Fredegundis, has never received a modern performance or recording, to my knowledge. And so Botstein and his forces performed an important service by giving us the opportunity to hear the uniquely fascinating score for Notre Dame. It was an especially appropriate choice for the ASO since Schmidt decisively made the orchestra the star of his opera – a somewhat odd, but not unprecedented choice for a staged drama. Notwithstanding a few gorgeous moments for the vocal soloists and some truly stirring choral interjections, it was the way Schmidt utilized instrumental colors and textures to tell a story that was the most striking aspect of this excellent performance. The libretto was written by Schmidt himself in collaboration with Leopold Wilk, and fashioned after Victor Hugo's popular Notre Dame de Paris. While the famed 'Hunchback' makes an appearance or two, the gypsy Esmeralda provides the central pivot point for an odd succession of events that focuses – from the masculine perspective – on her victimization and eventual death. Set in two acts, the plot can be summarized as two distinct love-triangles – one per act. As the opera begins, Esmeralda is already married (unhappily) to the crotchety, much older Gringoire (tenor). A local officer named Phoebus (awkwardly, also a tenor) has been watching the beautiful Esmeralda from afar and fallen in love with her. Not surprisingly, Gringoire becomes suspicious, plots in vain to keep a hold on Esmeralda, and finally kills Phoebus before leaping to his own death. In the second act, the love triangle is rather more oblique, and involves the seemingly ever-present Archdeacon (baritone) who is tormented with the unique inner conflict that arises for clergymen when they fall in love with gypsies. His 'rival' is the softhearted Quasimodo (bass-baritone) who also loves Esmeralda, and tries to save her when the Archdeacon decides to have her sent to the gallows. Ultimately too late to save the gypsy, Quasimodo causes the Archdeacon to fall from a parapet, leaving all the main characters dead except for the hunchback. Dramaturgically, the scenic requirements alone would discourage frequent staging of Schmidt's sprawling spectacle. The plot requires frequent shifting between large public scenes and more intimate spaces and lots of spectacular effects (high parapets, gallows in the distance, raucous crowd scenes, a suicide jump into the river and many more). The orchestral requirements are also formidable, including approximately eighty musicians with a rich brass section, two harps and organ. But perhaps the single biggest hindrance to renewed popularity for Notre Dame is the music itself, which, though lush and harmonically complex, provides precious little that is memorable for the singers. The whole opera plays like an extended orchestral tone poem with occasional vocal interjections. While fascinating on many levels, it's hard to make a case for the effort involved in a full staging when the singing roles are devoid of opportunities for pure vocal display or even in-depth characterization. Luckily for the audience at Carnegie Hall, the American Symphony Orchestra was on top form and swept us away with the vigor and passion of their playing. Leon Botstein conducted the score as if he had done so dozens of times; astonishingly assured, he led his musicians through Schmidt's clever harmonic undulations with confident ease and absolute belief in the composer's intentions. As the performance began, a beautifully atmospheric oboe solo provided the perfect introduction to the narrative role the orchestra would fulfill throughout the evening. In fact, Botstein's distillation of the myriad orchestral colors written into Schmidt's score was so vivid, the listener could easily have eschewed the supertitles without losing the essential plot details. One after another, scenic effects – Esmeralda's entrance, crowds gathering and dispersing, Gringoire's collapse, etc. – were executed with impressive precision. There were no weak links among the instrumentalists and the overall effect was thrilling. While Schmidt decisively shown a spotlight on the orchestra, he did not neglect the chorus, and the Collegiate Chorale (James Bagwell, Director) excelled at every turn. Making the chorus fully a 'character' in their own right, Schmidt relied heavily on the public scenes for both spectacle and as a vehicle for deluxe sonic effects. Never out of proportion, the Collegiate Chorale sang with impressive cohesiveness at all dynamic levels, and truly dominated in the many scenes where the crowds of Parisians threatened to overtake the more intimate drama playing out among the vocal soloists. In the thankless central role of the gypsy Esmeralda, soprano Lori Guilbeau had little chance to let her substantial lyric voice bloom. Nevertheless, she took full advantage of the occasional moments of soaring lyricism – most especially during her duet with Phoebus in the third scene of Act One. In the only other female role, soprano Tami Petty made an impressive cameo as Old Falourdel the innkeeper, showing off a remarkably secure high extension. As Phoebus, tenor Corey Bix started a bit tentatively, but warmed impressively to the high tessitura of his role. Ideally, the role seems to require a voice with more heft, but Bix handled the challenge well despite tiring somewhat as the evening progressed. Tenor Robert Chafin was a solid Gringoire, making the most of miles of text and spiky, unattractive vocal lines befitting the character. Bass Burak Bilgili made a sympathetic figure of Quasimodo, moving fluidly between the extremes of his character's stentorian outbursts and fawning love for Esmeralda. Finally, in perhaps the most multi-faceted role, baritone Stephen Powell declaimed the Archdeacon's many scenes with authority and solid vocal production. The Archdeacon could easily steal the spotlight in the hands of a superb singing actor, but Powell seemed satisfied to traverse the score with security but not much extra nuance or word painting. The audience responded at the conclusion with understandable enthusiasm, affirming the debt of gratitude owed to Botstein and his orchestra. Lovers of rare repertoire should plan ahead, since the American Symphony Orchestra has already announced the upcoming 50th Anniversary season for 2012-13. Among their typically eclectic offerings, they will offer Heinrich Marschner's Der Vampyr on March 17, 2013. 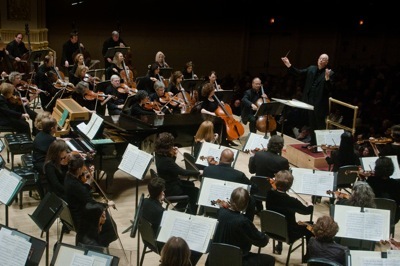 In addition, the ASO takes up its annual residence at Bard Summerscape from July 6 to August 19, 2012. While the programming is fascinating throughout, two operatic events deserve special mention. First, there will be fully staged performances of Chabrier's 1887 opera Le roi malgré lui (The King in Spite of Himself). Second, in an impressively thorough series of events programmed around Camille Saint-Saëns, there will be a concert performance of his rarely performed opera Henry VIII. With group transportation arranged by the festival from the NY metro area to Bard's scenic location on the Hudson River, all of these events are accessible and should be well worth attending.